^ Catchpole 2001, pp. 12-14. ^ Alexander & al. 1966, pp. 37-38. ^ a b c Alexander & al. 1966, p. 134. ^ a b Catchpole 2001, pp. 103-110. ^ a b Catchpole 2001, pp. 172-173. ^ a b c Alexander & al. 1966, p. 47. ^ a b c Alexander & al. 1966, p. 188. ^ Catchpole 2001, pp. 136-137. ^ Catchpole 2001, pp. 343-344. ^ Alexander & al. 1966, pp. 78-80. ^ Catchpole 2001, pp. 184-188. ^ Grimwood 1963, pp. 216-218. ^ a b c d e Catchpole 2001, p. 211. ^ Catchpole 2001, pp. 458-459. ^ a b Alexander & al. 1966, p. 25. ^ Alexander & al. 1966, p. 305. ^ Alexander & al. 1966, p. 503. ^ a b Catchpole 2001, p. 216. ^ Unknown 1962, p. 50. ^ Catchpole 2001, pp. 446-447. ^ a b c Alexander & al. 1966, pp. 640–641. ^ Catchpole 2001, p. 91. ^ a b c d e Catchpole 2001, pp. 92–93. ^ Gimbal Rig. NASA Glenn Research Center.. (2008年12月4日). https://www.youtube.com/watch?v=M3m5npzgVLY 2015年12月22日閲覧. 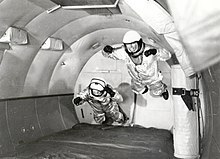 "The old multiple-axis space test inertia facility at NASA Glenn, fondly called "the gimbal rig," simulated tumble-type maneuvers that might be encountered in space flight. 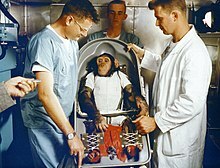 All Mercury astronauts trained on this rig." ^ Alexander & al. 1966, pp. xiii, 99. ^ a b Catchpole 2001, pp. 250, 308. ^ Alexander& al. 1966, p. 445. ^ Catchpole 2001, p. 166. ^ Catchpole 2001, pp. 363, 382. ^ Alexander & al. 1966, pp. 640-641. ^ a b Alexander & al. 1966, pp. 638-641. ^ Alexander & al. 1966, pp. 640–641 when nothing else is mentioned in table. ^ Alexander & al. 1966, pp. 353,375,433,457,483-484,501. ^ Alexander & al. 1966, pp. 638–641 when nothing else is mentioned in table. ^ Alexander & al. 1966, pp. 638-639. ^ Catchpole 2001, pp. 385-386. ^ Alexader & al. 1966, p. 306. Alexander, C. C.　; Grimwood, J. M.; Swenson, L. S. (1966). This New Ocean: a History of Project Mercury. USA: NASA. ISBN 1934941875. http://ntrs.nasa.gov/archive/nasa/casi.ntrs.nasa.gov/19670005605_1967005605.pdf. Cassutt, Michael; Slayton, Donald K. "Deke" (1994). Deke! U.S. Manned Space: From Mercury to the Shuttle (1st ed.). ニューヨーク: Forge Books (en:St. Martin's Press). ISBN 0-312-85503-6. Gatland, Kenneth (1976). Manned Spacecraft (Second ed.). New York: Macmillan. pp. 304. Giblin, Kelly A. (Spring 1998). “'Fire in the Cockpit!'”. American Heritage of Invention & Technology (American Heritage Publishing) 13 (4). オリジナルの2008年11月20日時点によるアーカイブ。. https://web.archive.org/web/20081120153024/http://www.americanheritage.com/articles/magazine/it/1998/4/1998_4_46.shtml 2011年3月23日閲覧。. Kranz, Gene (2000). Failure is not an option. New York, USA: Berkley Books. ISBN 0-425-17987-7. Siddiqi, Asif A. (2000). Challenge To Apollo: The Soviet Union and the Space Race, 1945-1974. USA: NASA. ISBN 1780393016. オリジナルの2008年9月16日時点によるアーカイブ。. https://web.archive.org/web/20080916023444/http://history.nasa.gov/SP-4408pt1.pdf. Unknown (1961). Results of the first U.S. manned suborbital space flight. USA: NASA. http://msquair.files.wordpress.com/2011/05/results-of-the-first-manned-sub-orbital-space-flight.pdf. Unknown (1961a). Results of the second U.S. manned suborbital space flight. USA: NASA. http://www.jsc.nasa.gov/history/mission_trans/MR04_TEC.PDF. Unknown (1962). Results of the first United States manned orbital space flight, 20 February 1962. USA: NASA. http://science.ksc.nasa.gov/history/mercury/ma-6/docs/ma-6-results.pdf. Wilford, John Noble (July 1969). We Reach the Moon. New York, USA: Bantam Books.